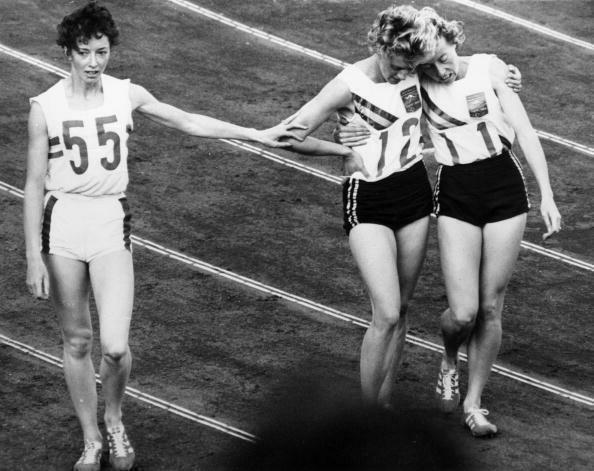 Ann Packer (55) extends a congratulatory hand to Betty Cuthbert (12), after the finals of the 400-meter sprint. Judy Amoore (11) is to Cuthbert’s left. At 18, Melbourne was a brilliant blur. At 22, in her prime, Rome was a frustrating flameout. But at the experienced age of 26, Tokyo was a blessing. 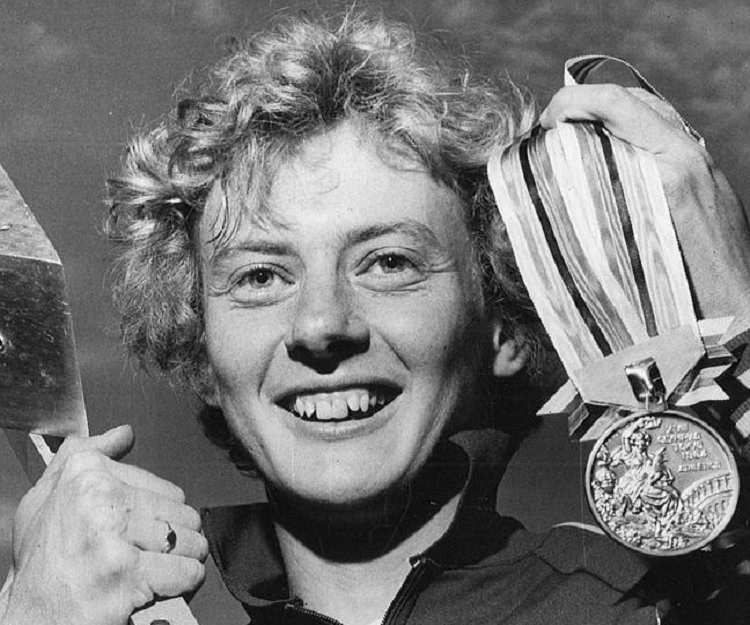 When Australian Betty Cuthbert won the finals in the 400-meter finals at the 1964 Tokyo Olympics, and her fourth career gold medal, she was grateful. I snapped the tape and realised I’d won. I felt so full of gratitude and humility that I clasped my hands in front of me, closed my eyes and said a silent prayer of thanks to God. Never before had I shown my appreciation so openly at the end of a race. I’d been able to control my emotions before. But not this time. I’d just won the final of the 400 metres at the 1964 Tokyo Olympic Games. I couldn’t cry. I was just too happy. Cuthbert, as she wrote in her autobiography, Golden Girl, had climbed a mountain. She achieved great success effortlessly in Melbourne and then failed to compete in Rome, sending her off into quiet retirement. But her inner passion to run and compete would not die. So she trained for the Tokyo Olympics, demonstrated little performance throughout 1963 and the first half of 1964, and essentially gave the press and the public little reason to believe that their Golden Girl, from Merrylands, New South Wales, was going to have any impact at the first Olympics in Asia. But she believed. And she wanted to win. Cuthbert wrote of her nervousness the night before the finals of the women’s 400 meter sprint, and how she failed to fall asleep. She was going up against Britain’s Ann Packer, who was considered a strong favorite, and played over and over in her mind how she was running in the dreaded 8th lane. Thirty minutes prior to the start of the finals, Cuthbert hammered in her starting blocks, and took a quick jog to stay warm in the cool, damp October weather. And then she was reminded, by a shout from the stands – “Make use of the wind.” The wind that crossed through the stadium in a way that provided both tailwind and headwind, depending on what side of the track you were running. Most runners had to deal with it, particularly those in the inner lanes. The key was to be mentally prepared for it. I got a wonderful start and went flat out as soon as I straight­ened up. For the first 100 metres I gave it everything I had and was gaining on Judy with every stride. She was the only one I was worried about at that stage. Ann would come later. As we raced down the back straight I felt the wind whip in behind me. Judy must have sensed me right at her heels because she spurted off a yard or so. I let her go. I told myself not to get flurried and to stick to my plan. I was having that little mental breather before really turning it on. Before I knew it we were coming to the curve. I caught Judy going into the bend, about 180 metres from home. Halfway through the 400-meter final, which takes the runners around one full lap of the stadium track, Cuthbert saw her rival, Packer, when the wind came into play again. Out of the corner of my eye I could see Ann just a fraction behind me. Then the wind hit us. It was like running into a brick wall, but I was determined not to let it straighten me up and kept telling myself to lean forward into it. I could still see Ann. The wind was terrible and was like an invisible hand pushing against me. I was awfully tired then but forced myself to keep driving ahead. I didn’t think it would ever come to an end. My legs were getting heavier as the line edged closer. I wondered how Ann was going and if she had the strength to catch me. I felt her right on my heels and knew she must have been just as tired as I was. But I wasn’t going to be the first to give in. Keep going I said to myself…hold her off…it’s not far now. Ten metres, nine metres, eight metres…. An Australian television commentator shouted to his audience: ‘My God, she’s going to win it!’ Then I was just a stride from the tape. I knew I’d done it. I’d won! Nothing had ever touched me as much as that medal cere­mony. Eight years before in Melbourne I had been too young fully to realise just what I had accomplished in winning three gold medals. But there in Tokyo I had at last achieved some­ thing I’d wanted for so long, sacrificed so much for and worked so hard to get. It was a dream come true. Posted in Olympics, Other Olympics, Tokyo 1964, Track and FIeld and tagged 1964 Tokyo Olympics, 400 Meters, Ann Packer, Betty Cuthbert, Golden Girl, Judy Amoore. Bookmark the permalink.